This is a Photoshop painting i did for the upcoming "The Mighty Nomad" gallery in September, where I'll be showing together with some great artists and friends. I'm really looking forward to that. 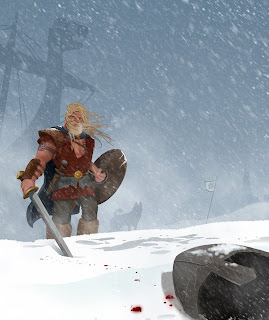 Being a direct descendant of the Vikings, I thought I'd do a Viking piece in honor of my somewhat violent ancestors:) I'm a native of the Danish city Århus, which together with Ribe is the oldest city in Scandinavia and the oldest Viking city in the world. It was founded by the Vikings in the mid 700's, though without knowing exactly who was the chief of the settlers. I think it was this dude and his name is Agnar, the true founder of Aros (the original form of Århus). Randver Radbardsson was the King of Denmark during the settlement of Aros and the main square of Downtown Århus has been the center of the city for over 1200 years. 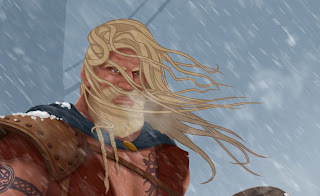 Side facts: As some might know, the vikings did not wear horned helmets and they were as excellent tradesmen and explorers as they were warriors. A Vik is a creek or small river, so it was called "To go Viking" when the warriors went raiding. Also, the Danish flag "Dannebrog" (Danish Cloth) is the oldest state flag in the world still in use, dating back to the 13th Century. Therefor the flag you can see in the background of my painting is not the Dannebrog, but instead the flag used prior to it, called the "Raven Banner". It is depicting a raven which is a symbol of Odin and his all seeing ravens.